A cat lazing around in your backyard, playing with toys and having a sumptuous meal is understandable, but one cannot imagine our feline companions fighting it out for glory and rewards in a deadly arena. Well, developers at Zeptolab have done the unthinkable – Put cats inside battle vehicles. The supply boxes that you receive contain various types of parts, such as wheels, body, weapons and boosters. A proper combination of primary and secondary weapons/boosters will make your vehicle stronger. For example: You can attach the forklift to the tiny slot and the rocket launcher to the bigger slot on your “Sneaky” vehicle body. The launcher keeps firing missiles and the forklift makes sure that the enemy vehicle falls on its back. When battle starts, real-life physics comes into play. Try to build your vehicle in such a way that it does not fall on its back or get cornered by the enemy vehicle. Remember that you can’t control the outcome of the battle, but you surely can build a smart vehicle that can defeat your opponent’s vehicle. Sometimes a vehicle with lower health/attack rate can win a fight owing to its smart design. A well balanced vehicle with the correct wheel size and a robust body has a lower chance of falling upside down. The size of a vehicle also has a big role to play in a fight. I have noticed that smaller vehicles can easily win against Titan vehicles, which has higher chances of falling on its back owing to its big size and height. Also smart use of parts such as the Forklift can surely turn the tide of a fight as it can easily overturn your opponent’s car. Want quick rewards? Start betting on a fight. 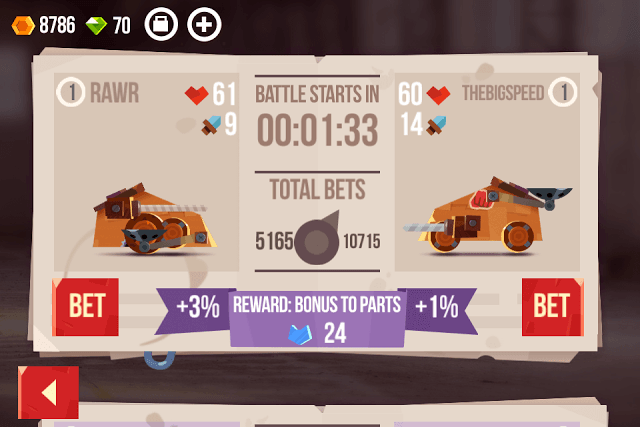 This unique feature lets you bet on a vehicle that you believe has better chances of winning. Now you can choose a vehicle based on the bet meter that shows the total bets in favor of one of the cars or judge their performance on the basis of their attack and health stats as well as their size/shape and attached weapons. Choosing a car that received more bets will grant you fewer rewards, so place your bets wisely. A vehicle with higher health/attack stats may not always win a fight as it may not be as smartly designed as the weaker vehicle so you will need to conjure up the fight scene in your mind and then make an educated guess keeping in mind the shape and the weapons used in both cars. Vehicle bodies can be broadly categorized into Classic, Titan, Surfer and Sneaky. However, there are some noticeable differences between two bodies of the same type. For example I have three “Sneaky” vehicle bodies and all three have weapon slots on different areas. One Sneaky vehicle body has three slots – Two primary weapon slots close to the wheels and a secondary weapon slot (for forklifts, repulses etc. ) on the upper part. Before finalizing on a vehicle body, do keep an eye on variations and choose the one that you think will have slots that can accommodate weapons and boosters like the repulse. Replace your wheels with those that offer an additional health boost. Wheels increase your car’s health. You may have noticed that some wheels have a heart icon above them. Such parts offer bonus health to your vehicle. Weapons also offer bonus stats if mounted on a specific vehicle body. For example: The 4-star Stinger provides an extra 30 percent health if it’s mounted on “Titan” body. Similarly, certain car frames also provide stats boost to specific weapons. Some Titan vehicles, such as the 5-star Titan will give a 1000 percent stats boost to any chainsaw attached to it. Before attaching weapons to a vehicle body, check its power (yellow lightening icon). A weapon’s power cannot exceed the total power of a body. So if “Sneaky” has a total power of 11, then make sure you attach weapons whose total power is less than or equal to the total power of the vehicle body. You can always boost the vehicle body’s power if you have the power toolbox. Just drag it to your car to increase its total power. You can also allocate skill points to increase the power of Sneakies, Titans and other bodies. Tap the cat icon on the home screen to use skill points. On your home screen, tap to edit your vehicle. Next, tap individual parts and then choose a part of the same type (body for body, weapon for weapon etc.). You can filter parts by wheels, weapons, bodies etc. by tapping on part icons at the upper-right corner of the screen. Now drag an unwanted part onto the current part in the preview screen. Before fusing, check whether the duplicate or spare part can really improve your current part’s stats. You can see stats change at the top of the preview screen when you drag a spare part onto an attached part of your vehicle. Note: Parts once fused with your vehicle can’t be brought back, so make sure you choose only those that you don’t want. Once you reach stage, you will receive better parts. Build a vehicle using 4 or 5-star parts and then fuse all unwanted/duplicate parts with your newly designed vehicle. In CATS: Crash Arena Turbo Stars’ Championship mode, winning an “X” number of fights in a row will promote you to a new stage. You will also receive rewards like coins, supply box, league points and skill points (paw icon). These skill points can be used to boost a part, earn bonus coins and improve toolboxes. I would recommend spending skill points on parts that can improve your vehicle’s health, power and attack stats. For example: If Stingers are you fave go-to weapon in quick fights, then you should spend skill points to upgrade “Master of Stingers” to increase damage of all stingers. If you want to increase power for all Sneakies, then invest skill points to the “Power of Stingers” upgrade. 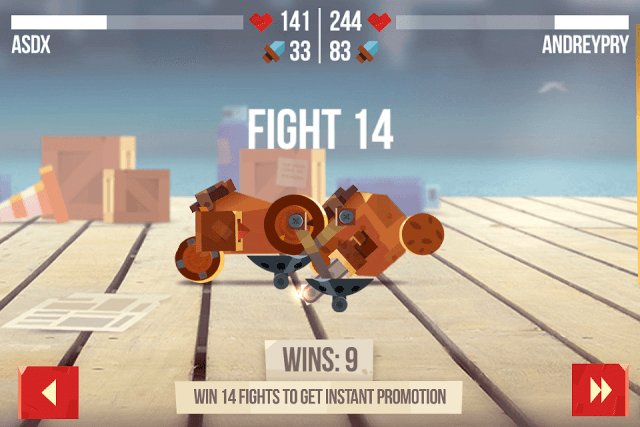 Try to achieve consecutive wins in Quick Fights to earn league points. A higher win streak will secure your position high up in the leagues. The more fights you win, the more points you will earn. You should aim to be in the top 10 if you want better rewards (gems, supply boxes etc.). Points will be deducted from your total league score if you lose a quick fight. Try to build a strong vehicle to avoid back-to-back losses. When you bet or engage in a quick fight, do keep in mind that winning or losing affects your overall league and global ranking. Your rating is determined by the points you earn and lose in a bet or quick fight. Win 3 quick fights in a row to get a supply box. Supply boxes contain parts, weapons and gadgets that can be attached to your body. You cannot open a box immediately after winning. It can take up to 4 hours to open one. The reward box is slotted into one of the 4 empty spaces on your home screen. You can earn a crown for a 5-win streak. You will have to earn 3 crowns if you want better quality parts from a supply box. You also receive a supply box from advertisers or after being promoted to a new stage in championship mode. Before dragging a part onto a vehicle, check its rating. Each part has a starred rating. The higher a part’s star rating, the better are its stats. So a 4-star Stinger will be a better bet than a 2-star stinger as the former will have a high attack rate. Rating ranges from one to five stars so make sure you choose the best parts among all to boost your vehicle’s overall stats.